We all need our sleep: beauty, brains, energy or just for rest and recuperation. Keep to a schedule, even on weekends. Get exercise everyday, but not just before bed. Don’t eat or drink alcohol or caffeine before bedtime. Keep your bedroom environment conducive to sleep: cool, dark and quiet. Give your body (spine, lumbar, shoulders and hips) the support it requires with a proper mattress. If you can take care of items 1 – 5, we can help you get a mattress that, as Goldilocks said, is Just Right. Do you predominantly sleep on your back, stomach or side? Do you generally like your mattress softer or firmer. is too short to compromise on proper support in your mattress. We will build your mattress to your sleep demographics. And every FloBed is adjustable. With our Goldilocks Guarantee you can make it softer or firmer for the 20 year life of the mattress. Because we manufacture every FloBed latex mattress and ship it directly to you, we can afford to put in the very best materials and provide you with unparalleled customer service. All at a price that is less than you will find in the traditional distribution cycle because you are only paying for the materials and the 10 person company that makes your FloBed. You are not paying for storefronts, wholesale and retail sales force, extra transport and all the usual cost of doing business. You get a Talalay Latex Mattress and a money back guarantee as well as a Goldilocks Guarantee allowing you to order new firmness cores at a steep discount for 20 years. Should being tired, be something we want? Whenever I speak at a conference, I try to catch a few of the other presentations. I tend to stand in the back and listen, observe, and get a general sense of the room. Lately, I’ve been hearing something that disturbs me. A lot of entrepreneurs on stage have been bragging about not sleeping, telling their audiences about their 16-hour days, and making it sound like hustle-at-all-costs is the way ahead. Rest be damned, they say there’s an endless amount of work to do. I think this message is one of the most harmful in all of business. Sustained exhaustion is not a rite of passage. It’s a mark of stupidity. Literally. Scientists have suggested that scores on IQ tests decline on each successive day you sleep less than you naturally would. It doesn’t take long before the difference is telling. People pulling 16-hour days on a regular basis are exhausted. They’re just too tired to notice that their work has suffered because of it. And there’s more to not getting enough sleep than compromising your own health and creativity. It affects the people around you. When you’re short on sleep, you’re short on patience. You’re ruder to people, less tolerant, less understanding. It’s harder to relate and to pay attention for sustained periods of time. Sleep-deprived managers are terrible managers, too, not least because of the awful example they set. Why spend the time and money to recruit a brilliant staff if you’re going to drive everyone into a state of insensibility? One argument I hear a lot about working long hours is that when you’re just getting started, you have to give it everything you’ve got. I understand that feeling. And there’s certainly some truth to it. But here’s what I see happen over and over: People don’t stop working that way. We’re creatures of habit. The things you do when you start doing something tend to be the things you continue to do. If you work long hours at the beginning, and that’s all you know, you can easily condition yourself to think this is the only way to operate. I’ve seen so many entrepreneurs burn out following this pattern. So it’s important especially when you’re forming your habits to get a ton of sleep. You’ll start better, think better, and be a better colleague and boss.Sleep is great for creativity. Sleep is great for problem solving. Aren’t these the things you want more of, not less of, at work? Your brain is still active at night. It works through matters you can’t address during the day. Don’t you want to wake up with new solutions in your headrather than bags under your eyes? Yes, sometimes emergencies require extra hours. And, yes, sometimes deadlines can’t be moved and you’ll need to make an extra push at the end. That happens. And that’s OK, because the exhaustion is not sustained; it’s temporary. Such cases should be the exception, not the rule. In the long run, work is not more important than sleep. If you aren’t sure how important sleep is, think about this: You’ll die faster without sleep than you will without food. And, on balance, very few problems need to be solved at the 12th, 13th, 14th, or 15th hour of a workday. Nearly everything can wait until morning. At Basecamp we think 40-hours a week is plenty. We encourage everyone to get a full night’s sleep, every night. Good night, and sleep well! And BTW, here’s why Aetna’s CEO pays employees up to $500 to sleep well. Science backs it up. Having a hard time falling asleep? Don’t worry you are not alone! This time of year is difficult as we are transitioning from summer into fall. Weather will be changing soon, children are going back to school, and before you know it Thanksgiving will be upon us. Life can get hectic, but it is important to take time out of your day to slow down. An easy way to wind down after a long day is bedtime yoga. Our customers love the Prodigy 2.0 Adjustable Base from Leggett & Platt. “I constantly struggle with pain in my sciatica. When I raise my feet and head at the same time in the adjustable bed, I feel some pressure relief in my back. Also, my husband has asthma and finds that he sleeps best when he is propped up. Instead of using all of our pillows to prop himself up, now all he has to do is raise the head on his side of the bed. Keep the same bedtime on weekends. Staying up late two nights out of the week will throw off your sleep schedule and make it hard to wake up on Monday morning. Avoid sleeping in on weekends. Do not sleep more than one or two hours past your normal wake-up time. Enjoy your Sunday night. Plan a fun Sunday night ritual, that way you can look forward to Sunday evenings instead of dreading them. FloBeds Talalay Latex lifts. How our latex mattress supports both they spine and your muscles. FloBeds creates a mattress that’s better for pregnant women, while sleeping on their side. FloBeds Talalay latex mattresses are great for women who are pregnant because they are adjustable . As a mother progresses through each trimester, she can switch around the layers on her side of the mattress. This will ensure that she gets the support she needs throughout her pregnancy. It is time to change the way our culture looks at sleep. Andrea has been able to balance sleep and work to live a healthy and successful life. Think about changes you can make to your bedtime routine to be able to lead a better life. To learn more about the MVP’s sleeping habits watch the video featured in the Time article by clicking here. FloBeds believes sleep to be one of the most important things we can do for our bodies. Revolutionize the way you sleep! 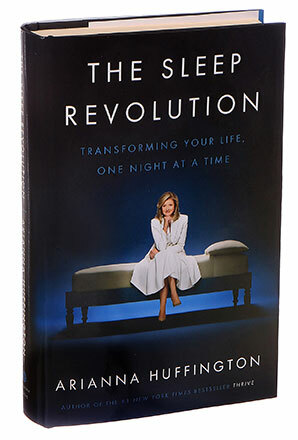 The Sleep Revolution, written by Arianna Huffington, is a great read for anyone looking to be more successful in life. As she explains in the interview video below, there are many reasons we need to reevaluate the importance of sleep in our lives. When you are well rested you are less likely to dwell on mistakes and more mentally capable of moving forward. Lack of sleep has been linked to obesity, diabetes, cancer, hypertension, and Alzheimer’s. Insufficient sleep leads suppressed immune system and sickness. We stopped valuing sleep during the first industrial revolution. Society believed humans could work like machines, but the truth is we cannot. Tink about the role sleep plays in your life and where if falls on your priority list. It’s time to move sleep closer to the top of that list. One wouldnât think that about one of the most powerful women in the world, the author of 15 books and a founder of a news site that sold to AOLfor $315 million in 2011. But of all the things on her agenda, which would exhaust most mortals, sleep is at the top. Her new book, “The Sleep Revolution: Transforming Your Life, One Night at a Time” (Harmony), is a call to bed. It is also inspiring a turbocharged national tour that involves “sleep fairs” at colleges and an educational “takeover” of a JetBlue flight during which she gave out books and answered questions. If sleep is a gateway to her dreams, then her bedroom is the mother ship. It is one of four in a vast apartment she transformed a few years ago with the help of the designer Steven Gambrel. To achieve that, she hired Mr. Gambrel to add walls to break up the space, for which he also designed much of the furniture. Peter Mucek, the decorative painter, plastered the walls to emulate a golden Venetian glow.Michael S. Smith, who redecorated some rooms in the Obama White House and is a friend, suggested that she treat the loft’s concrete columns with metallic brown paint to give them an ancient bronze feel. Mr. Smith also designed some leather chairs and an ottoman. Her home now has a regal and romantic ambience that seems in perfect keeping with Ms. Huffington’s personality. Everything in the decidedly low-tech bedroom is as carefully considered as a business move. On a bed surrounded with Fortuny curtains in a restful light blue, she sleeps on organic cotton sheets from a collection calledHuffington. The Huffington line, carried by Coco-Mat, a nearby bedding shop, was designed by her daughter Isabella Huffington, 25, an artist who shares her home. Her pillows are stuffed with soporific hops and barley. Across the room are two Gordon Parks photographs, including the bucolic“Boy With June Bug.” Over her night stand is a photograph of her other daughter, Christina, now 27, at Isabella’s christening. Roses and peonies rest in a vase by a journal with a black cover decorated by Isabella. Next to it is a pen light. “So if I wake up in the middle of the night, I can write down my dreams without turning on the light,” she said. Dreams, of course, are welcome; business ideas, not so much. On a desk and dresser across the room, which she can’t reach from her bed, Ms. Huffington has several china Herend Rothschild bird bowls to hold such workaday items as Post-its and manuscript clips, and a lacquered box for her packed appointment book. “I hide the whole mess to forget about it,” she said, lifting and setting down lids like a cook. At bedtime, her phone and electronic devices are relegated to the foyer outside the bedroom, to recharge under a wall of family photographs. Withdrawing from her machines, she said, is part of a half-hour “transition to sleep” ritual that includes writing down the many things she is grateful for; dimming the lights; taking a warm bath in Epsom salts by flickering candlelight; and changing into a silk nightgown to greet sleep with respect. It also helps to have soundproofed windows, which required a complicated and expensive installation process that made her renovated home as quiet as a church. Indeed, her cellphone rings with the sound of cathedral chimes. “I love church bells, don’t you?” she asked in a seductive purr. It was time for a tour of the rest of the apartment. It is one of her two homes and very different from the one she has in California. Her spacious living area â with a custom bookcase, a gilded Louis XV desk, gilded bronze and cobalt 18th-century candelabra and a 19th-century Italian mirror above the fireplace â has the feeling of something between a papal chamber and the Oval Office. “Isn’t this beautiful?” she asks, gesturing to a hand-painted screen by Mr. Mucek that hides a small white kitchen area, where she doesn’t concern herself with cooking. Just the same, Ms. Huffington loves to hold the many dinners that she doesn’t prepare at a hand-painted faux marble dining table. “I know how to make a really great cheese plate,” she said. She makes tea, too. Near the front door is a portrait of a woman by FranÃ§oise Gilot, which Ms. Gilot, who spent 10 years with Picasso, gave Ms. Huffington around the time Ms. Huffington was writing “Picasso: Creator and Destroyer,”published in 1988. The portrait of her daughters is by Nelson Shanks, who also painted Bill Clinton, Pope John Paul II and Diana, Princess of Wales. “But what I love most of all are the works of my daughter Isabella,” she said. As if on cue, Isabella emerged from an art studio next to her bedroom. (Christina has her own place.) The two put their arms around each other. The daughter, as it turns out, also respects a good night’s sleep. Her mother laughed. No need for that at home. It was 10 o’clock, and with a television appearance scheduled for early the next day, time to dim the lights and take the moment seriously. The church bells on her phone were ringing. She ignored them.